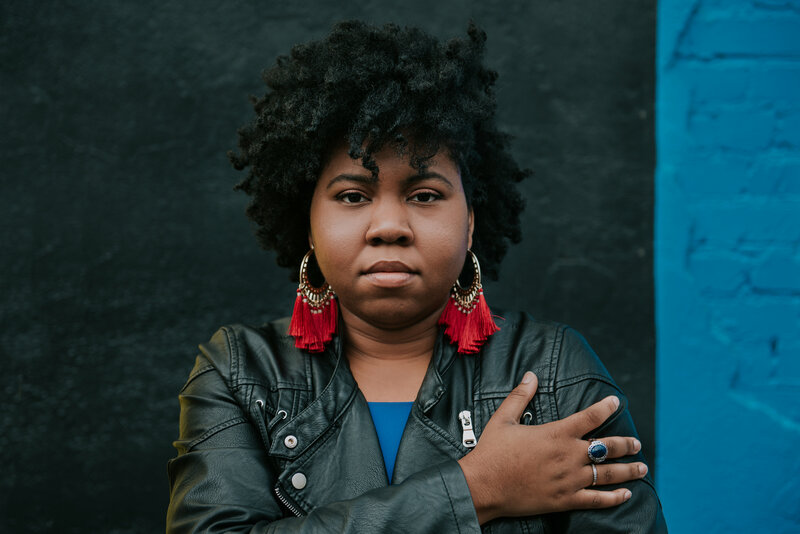 Ashley M. Jones is a poet, organizer, and educator from Birmingham, Alabama. She holds an MFA in Poetry from Florida International University, and she is the author of Magic City Gospel (Hub City Press, 2017) and dark / / thing (Pleiades Press, 2019). Her poetry has earned local and national awards, including the Rona Jaffe Foundation Writers Award, the Silver Medal in the Independent Publishers Book Awards, the Lena-Miles Wever Todd Prize for Poetry, a Literature Fellowship from the Alabama State Council on the Arts, the Lucille Clifton Poetry Prize, and the Lucille Clifton Legacy Award. Her poems and essays appear in or are forthcoming at CNN, The Oxford American, Origins Journal, The Quarry by Split This Rock, Obsidian, and many others. She teaches at the Alabama School of Fine Arts and the University of Alabama at Birmingham, and she is the founding director of the Magic City Poetry Festival in Birmingham, Alabama. Cecilia Savala: I read in an interview that you try to use your role as a poet to spread knowledge. In creative writing classes, we’ve discussed that poems don’t have to be “true” to be real. How much of your poems are true facts and how much are adjusted to better fit the poems’ agendas? Ashley M. Jones: In my historical poetry, I try to keep it as close to fact as is humanly possible. That is, I do my research before writing, especially if I’m writing about an event at which I couldn’t have been present. For example, I wasn’t alive in 1963, but the poems I wrote about that time still needed to cling to facts, as my goal isn’t to reinvent or misrepresent fact, but to add a human element to events we easily write off as “ancient history.” So, in those poems about real things, I’d say they’re 90% pure fact (described in poetic images) and 10% my own attempt to connect with the event and insert myself somehow. In poems about my own life, I try to stay true to the way things really happened, but we know that “emotional truth” in our own memories isn’t always the same thing as “fact.” Our memories are faulty, but even with that, I do try to stay as close to “fact” as I can. CS: You’ve been described in one interview as an “exemplary literary citizen.” What advice would you give to others, especially other poets, regarding literary citizenship and how to participate in the ongoing conversation? AMJ: I’m grateful to have been described as an exemplary literary citizen—I certainly hope I’m living up to that! I think the way I’m able to keep myself honest/humble and have good literary citizenship is that I stay focused on the work, on my own lane, and on being supportive to my fellow writers. It’s easy, I think, to get a big ego as an artist, especially if you’re in a season of recognition or awards. What you have to realize, I think, as an artist, is that none of this (the poetry biz, the literary world) exists if we don’t help each other. It’s also impossible to truly be in the literary conversation if you’re not listening to others. So that means, you buy other people’s books, you attend people’s readings, you engage in true human connection and don’t get caught up in your own vacuum. Just stay involved—I try to stay aware of what my friends are publishing, I purchase every book, even if it means my to-read list is impossibly long. I am truly happy to see other writers succeeding—it means we’re getting closer to opening up the literary canon and the literary landscape, which should be everyone’s goal! CS: In dark // thing, the respective speakers in the poems, “You Tell Me I’d Be Prettier With Straight Hair” and “Recitation,” seem further removed, as if being “othered” from the “other,” for being female and then for being in a gifted class. How do those poems address the speakers’ places in society and the separation of the individual within the community? AMJ: Both of these poems talk about moments in my life when I’ve really felt my otherness, inescapably. When that person told me that I’d be prettier with straight hair, the whole room suddenly felt small, like the whole room was eager to thrust my otherness in my face and run me out of there. I felt alone, even in a restaurant full of people—there seemed to be no one who could come to my aid, who I could look at and say “can you believe this?” In “Recitation,” I’m talking about a moment in elementary school (there have been many across my educational career) when I realized I just wasn’t like the other kids. First, because I couldn’t breathe like the rest of them—my tonsils and adenoids worked against me. But also because I felt like I didn’t really fit in with anyone—my Blackness wasn’t “Black” enough, and I didn’t identify with the White kids either. This floating sort of otherness was something I struggled with until college, when I was able to meet other people who had been floating, and we felt, finally, un-othered together. Both of these poems how our society is so good at making people feel like they’re wrong if they don’t fit into a certain box. Our beauty standards, our desire to limit human expression according to race, and our continued oppression of people of color are all topics we need to continually examine in order to make a little progress away from them. CS: Your poems mention so many famous people, dead, alive, and even fictional. In dark // thing, we encounter Harriet Tubman, George Jetson, and Whitley Gilbert. If one of those people (or any of the others) could read your poems, who would you choose and why? AMJ: Gosh, what a question! I think I would honestly have to choose Harriet Tubman. The fictional folks are cool, but I really would love to talk to Harriet Tubman about her life, and see if I got even a little bit close to portraying her in those poems. Instead of imagining her voice and personality, it would be so amazing to get to experience it firsthand! CS: You really own the page; every space and indentation has something to say. Many of your poems arealmost-formal, “Broken Sonnet for the Decorative Cotton for Sale at Whole Foods,” “Water,” “Love/luv/,” “Proof at the Red Sea” all exhibit your courage to take on forms but also your strength and unwillingness to do things the way they’ve always been done. Do you feel that this technique of marrying the familiar with the experimental pushes the boundaries of what’s comfortable to entrap your readers into facing a new perspective? AMJ: Yes, I’m intentionally playing with form. There are, of course, poems which adhere exactly to their specific form, but breaking those forms is a political act. Like Phyllis Wheatley, I’m showing the oppressor, the ivory tower, that I am fully capable of speaking their language, but like Gwendolyn Brooks, I’m breaking their standards of art by writing about my people instead of fair maidens. I’m breaking their standards by literally breaking the forms open to make space for more kinds of writers, which is my ultimate goal in this life and this writing life—opening the canon for those of us who have been shut out of it for far too long. Cecilia Savala is a student at the University of Central Missouri where she is majoring in English Education and is the Editor in Chief of Arcade Magazine. She has work forthcoming in Underground Art and Literary Journaland was selected as the Honorable Mention for the Assembly for the Teaching of English Grammar’s 2019 Future Teacher Award. Cecilia is also the proud mother of two teens who are her whole world.